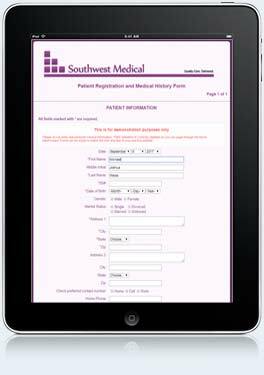 Secure online medical and patient intake forms. Patients spend over 20 minutes filling out paper forms in your office, which backs up your schedule and leads to typographical errors. Save time by allowing your patients to fill out HIPAA compliant online forms containing medical or other sensitive information before their appointment. Narrator: The patient intake process is often a time consuming and expensive task that becomes a burden to both patients and your employees. Patients are met with paperwork upon arrival, forms aren’t completed on time, incorrect information is submitted, and your staff has to spend countless hours receiving, processing and correcting patient information before a doctor is even seen. Time isn’t the only thing lost. Mailing forms to patients, restocking printing supplies, and the cost of paying staff to manage all of this is incredibly expensive. Your practice needs a better way which is why MedForward has developed HIPAA compliant online forms that make it easy for your patients to securely submit information online. 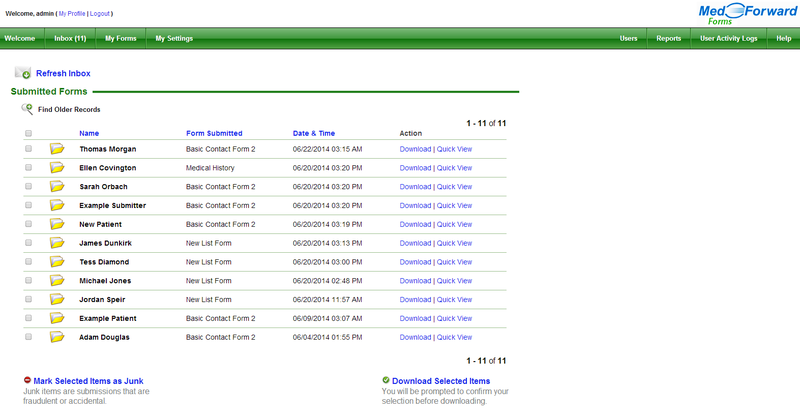 This is how it works: MedForward takes your existing forms and builds them into responsive, mobile friendly web forms. As a MedForward customer you’ll have access to our form builder tool that will allow you to edit, modify or create new forms anytime. Our system makes it easy for patients to answer nearly any kind of question from simple to complex. MedForward’s built-in file uploader can accept any type of document you choose and real time diagram drawing allows patients to fill out custom medical diagrams on their computer, tablet or mobile device as a part of the submission process. Other features include CSV exports, real e-ink signature implementation, question logic, auto population, submissions filtered by office location as well as API access for integrating MedForward with your EMR system. As soon as a patient submits their form online you will get an email notification letting you know it is available to be processed. Simply log in to download the form and you’re done! Contact us to begin the process of integrating MedForward and stop wasting time and money while providing patients with a seamless experience. We offer free estimates and demos of our software with no obligations. An increasing problem for medical offices is the time lost as patients fill out forms when they arrive at their scheduled appointment time. Your office loses valuable staff time and revenue due to this unnecessary waste. Filling out forms is easy. Easily added to your website -- no software installations necessary. "Forms has allowed us to streamline our patient intake system." Hunterdon cardiology office has multiple New Jersey locations. The program allows them to receive notifications filtered by which location the patient will attend. Our customers include healthcare professionals and a range of businesses processing medical information including dentists, physicians, therapists, counseling services, hospital networks, chiropractors, personal trainers, and insurance processors. 1. 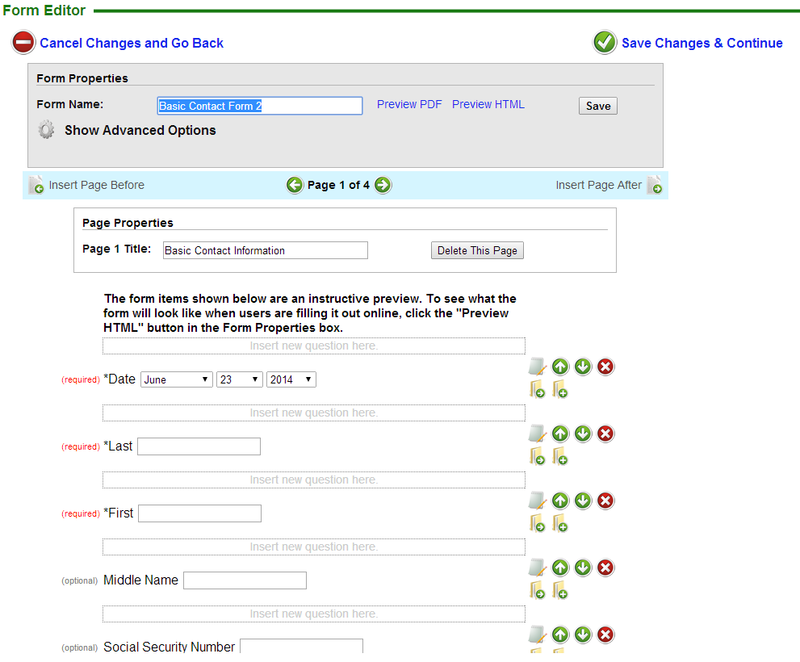 Form creation: Your existing forms are converted to online format and integrated with your website. Patients can still fill out the old forms and bring them in. Works with any website or without a website. Your forms can match your PDF exactly. 2. Receive form submissions: You choose an email address to be notified each time a new form is received. 3. 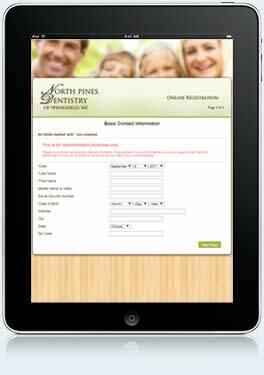 Print or file: Simply login to securely download the form. 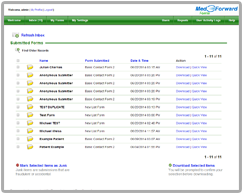 After it is downloaded, it can be stored in your medical record system or printed and filed in a paper record system. 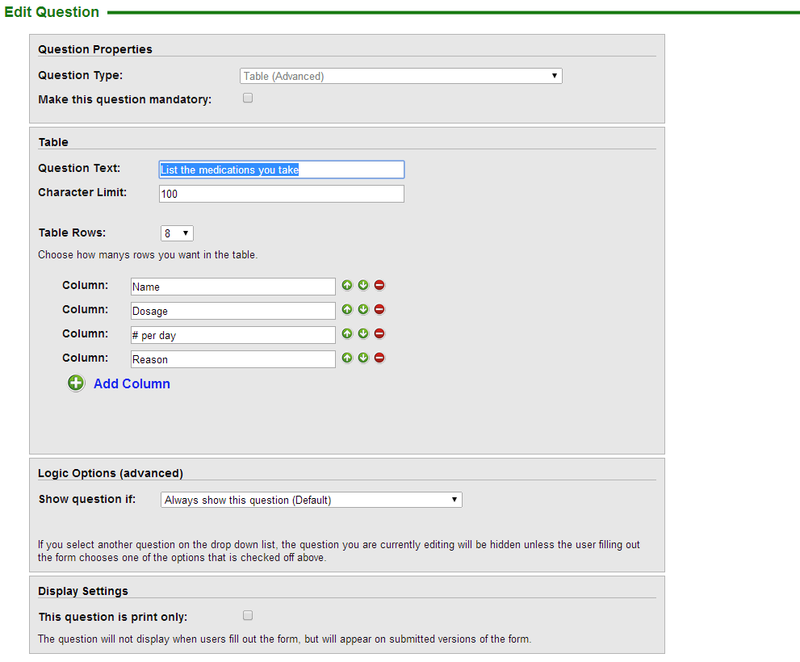 Use your exact PDF form layout or dynamically generate a PDF form from your questions. Easy to use form editor lets you build or change forms. Runs on dedicated server with dedicated hardware firewall. Runs in a world-class data center. Separate SQL database and isolated web service. HTML forms easy to fill out for users. Easy to use form editor. Forms downloadable as PDF, HTML, or CSV export. 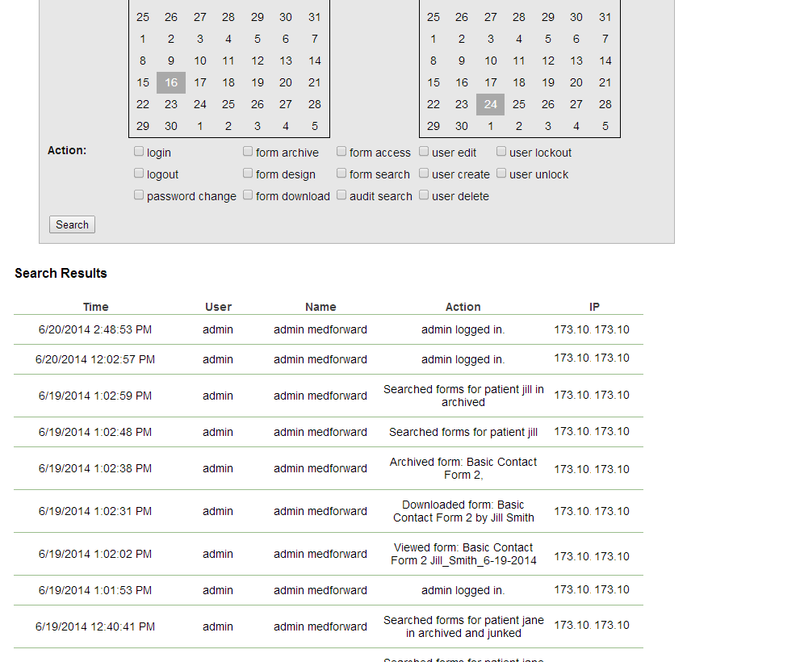 Audit log tracks all user activity. Deployment walk through for your staff. Tiered usage plans to fit your business. The MedForward HIPAA compliant online forms solution exceeds security and accounting guidelines and is remarkably easy to use and get started. Our solution is proven and used by industry leading web companies which need to handle web forms with sensitive information. The web app is built to solve your specific challenge of easily taking web input while complying with specific regulations. Unlike generic form web applications that only offer SSL, which is not enough, MedForward forms offers what you need. It is backed by a highly competent team of consultants which can assist with your deployment, support requests, and related consulting services. You pay month-to-month and are not required to make a commitment. The datacenter is a U.S. centrally located extremely secure, state-of-the-art, with redundant power systems, 24/7 security & surveillance, dedicated environment with a dedicated firewall. Each client receives a separate web host process & SQL database deployment. MedForward was founded in 2007, is privately owned, and based in the United States. All code is written in house and not outsourced. We focus on provided outstanding customer service and superior quality in all of our work. There is a no obligation consultation & proposal, with an optional HIPAA compliant online forms web demonstration. "It has helped people complete their applications online instead of driving to the office filling one out. It helps us be more accessible to our workers." "It helps with the amount of time a patient is in the waiting room. More convenient for that patient and the staff." "The ability for patients to go directly to our website and fill out electronic forms has helped our practice become more efficient and has helped our patients with taking away the stress of a busy waiting room and having to spend 15 minutes filling out their important medical information. Our patient check-in process has improved our workflow immensely." Will any SSL / TLS encrypted form comply with HIPAA? No. SSL / TLS encryption alone is not enough to comply with HIPAA rules. Anyone who collects electronic patient health information (ePHI) must follow HIPAA guidelines. In addition to encryption, you must have an audit trail in place of who has accessed the information, a business associate agreement on file with your vendor, and the vendor must comply with HIPAA regulations internally on their server. Please contact us for a list of HIPAA rules and the specific mechanism MedForward has in place to help your business easily comply. MedForward looks at your current forms and converts them to electronic format for you. There is a non-refundable set-up fee for this service. Our support teams walks you through the entire process personally to ensure a smooth and easy set-up. The program includes an easy-to-use editor which lets you build the forms yourself or make changes to them in the future. Your set-up quote will be reduced to the minimum amount if you choose to build the form yourself. Will the layout of my forms need to change? The layout of your form will not need to change. Our program supports HIPAA compliant online fillable PDFs, web based forms that map onto your PDF, or create default program generated PDF files based on the question in your web form. How are the online medical forms secured? The forms are not transmitted by e-mail. You do receive an e-mail notification when a new form has been submitted. The site is protected using TLS encryption. All user activity is logged. The highest security methods available are used. The forms are fully HIPAA compliant. In addition to be encrypted by 128-bit encryption while in transit, the data in forms are also encrypted on the server. Will online patient forms work with my medical records system? For most systems, yes. All medical records systems are different, but most will allow you to store the online submission as a PDF file associated with a patient's record. Our program also offers the option to export data as a CSV file. Often users can integrate the data from a CSV file into their current system, though options vary based on the system itself. 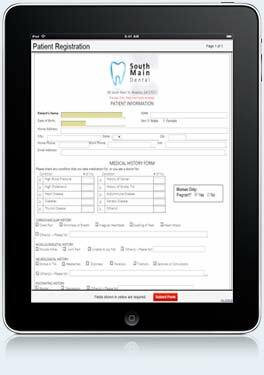 Do the online medical forms work with a paper based medical record system? Yes. You can easily print the records and file them in the patient's chart. What are the computer requirements to run the medical record system? The system is web based and will run on any computer platform, including Windows, Mac, Linux, or other system platforms. The system is tested with Firefox versions 2 and above, Safari versions 3 and above, and Internet Explorer versions 7 and above. No software installations in the office are necessary. Is it necessary to follow all of the HIPAA Policies? Can the MedForward team see my form inbox submissions or data when providing support? No. The data is encrypted at rest and not viewable by the MedForward team. The MedForward Forms web application is developed by MedForward internally and is not a resold solution. MedForward does not outsource development and all its operations, including hosting, are fully based in the U.S.